He was known as Baba Bohar, the Giant Tree. A pillar of the progressive Punjabi writing style, Principal Sant Singh Sekhon passed away on October 8, 1997 having seen nearly nine decades and various socio-political upheavals "
Principal Sekhon, as he was popularly known introduced systematic criticism in the arena of Punjabi literature for the first time. His contribution to the Punjabi language as a writer, translator, novelist and dramatist will always be remembered. Padamshree awardee Sekhon was also honoured with the Shromani Sahitkar' in 1965. In 1972 he won Sahitya Academy award for his writings too. One of the most eminent writers of this century Sekhon was the product of a wave of progressivism which blew on the land before independence. But by the evening of a distinguished career he had become sympathetic of the Sikhs for their political plight. According to Prof. H.S. Bedi of Khalsa College Amritsar, sometimes back when he was honoured at a Gurdwara in Chhehrata Amritsar his introspection reflected regret and repentance. Sekhon who wished to live till 100, had penned down his autobiography which became surrounded by controversies for containing adverse remarks about their wives and other women in the 'houses that he visited. The autobiography published by Guru Nanak Dev University was later banned. 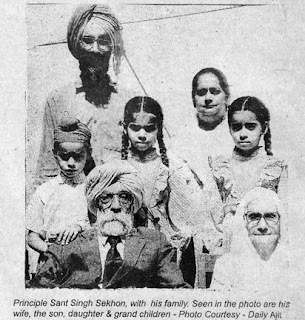 Born in the year 1908, Seknon was appointed lecturer in the Khalsa College Amritsar in 1 931 . At that time being a Marxist he had to leave Khalsa College in 1951 due to sharp ideological differences. During his long and distinguished career he taught at Gursar Sudhar, Fategarh Sahib and Jandiala. His writings have been patronized and have formed the major pad of syllabii of schools and colleges. Literary length of this 'Marxist writer can be measured from the fact that he not only attended the All India Progressive Write/s Conference, Lukhnow in the year 1936 but presided the Punjabi Chapter when Mulk-Raj Anand headed English and Munshi Prem Chand, Hindi and Zohir Abbass, Urdu. Principle Sant Singh Sekhon, with wife. the son. daughter & grand children & his family.